The family safari can be arranged as a Camel Safari or a Jeep Safari – or as a combination of both: Camel & Jeep. Further we offer the safari to different destinations: We can go through the mountains & canyons, passing by green oasis and soft sand dunes – or optional we could go down to the sea and combine our desert trip with some snorkeling. Anyway, our amazing journey will lead us through the home land of the South Sinai Bedouins. It will be an unforgettable experience for you and your family, discovering the beauty of Sinai’s desert together with a family leading you through their homeland. Like this you will get a very good insight into the Bedouin’s life, traditions, habits and culture at the same time. On this trip the Bedouin women will provide you with typical Bedouin food and drinks. They will show you how they prepare the food, and what out of Sinai’s nature they can use for it. 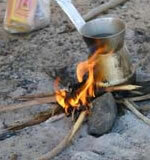 They will bake the famous Bedouin bread (Fiteer or Farasheer) – and if you like – you could join them. Further, they will introduce you into Sinai’s herbs and plants – and how to use them. 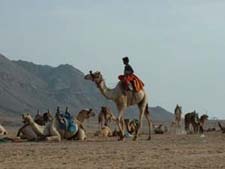 The Bedouin men are responsible on the safari for the transportation by Jeep or by Camel. Once arrived at a rest place, they will prepare the camp area, collect wood and light our camp fire, which is always the most important thing to be able to offer fresh tea, cook our meals and bake bread. You and your family will enjoy sleeping in the calmness of the nature under millions of stars. * Minimum 4 pax are needed to organize this trip.